Hey there and welcome back! Today I thought it would be fun to look at 2 fun and easy ways to wear the new Zoya polishes with art by using nail art vinyls. That being said both looks will have all Zoya polish, and a different nail art vinyl. This time the vinyls are from Twinkled T! First up here I am using Blake, and a gold Zoya. I would love to specify the gold polish but it was a mini that I have had for a bit and it just so happens that they no longer have it, and the label cuts off the name. Ekkk I know, however the good news is you can use what ever type of gold polish you would like!. For my quatre foil nail I used the "Almaz Vinyls" from Twinkled T. I used Blake on top of the good and did it just in one coat which actually allowed for the blue to show through more which I really liked! If you didn't already, you should check out this weeks earlier post that was all about the Party Girls collection here. To then bring the full look together I just got out a dotting tool to create a similar shape with gold on my ring finger. I think that kind of just made the full look! I love how this mani has such a bold contrast in colors and I think it's just a really fun look for the colder cozy days! Next up I have a more more calm less in your face mani to share. For this one I used Solstice as my base shade and then for the topper on my ring finger, the pattern on the nail that was done with vinyls and the lil dots I used Nadia. All of which are from the Party Girls collection. I then used the X Pattern Stencil from Twinkled T for the X design. I personally love this stencil. It goes with any polish. Plus in this case it gives us a nice shimmer-y contrast! :) All together it gives you just enough of something different yet not so bright, bold, and or in your face which is perfect for some! Well that is it for today! I hope you all enjoyed these different looks! 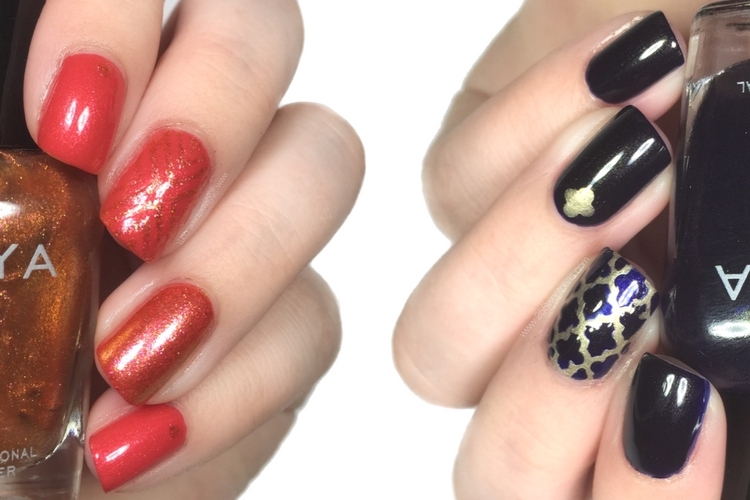 Tomorrow I have a fun post coming for you with some really pretty polishes! I can't wait to share, so that is it and I will see you soon! Adios! It really is! Its one of my fave go to looks! I love the gold designs. Very pretty! These are both cute looks! The quatrefoil ones are always a fave. Agreed, they are always a good idea! I love the first one! It looks classic and majestic! The color contrast with Blake and the gold is beautiful. That's my favorite. Beautifully done! I love the combination of black and gold. How fun! I really want to try these patterns! I love that you used Blake and paired it with a gold shade to really let those hints of gold shimmer in the blue pop! That it is! Thank you! Thank you! I've spent so much time trying to find the right ones that I liked and didn't look to weird or forced and these are what I can do with out the weird cramps! LOL! I read that totally wrong and though Zoya started making vinyls! Really pretty manis!